[2015.12.05]人民币“入蓝” 软妹币的“第一次” - 中国 - ECO中文网 - Powered by Discuz! 1.PASSING through the Suez Canal became easier earlier thisyear, thanks to an expansion completed in August. Now it is about to become alittle bit more complicated. Transit fees for the canal are denominated inSpecial Drawing Rights, a basket of currencies used by the InternationalMonetary Fund (IMF) as its unit of account. This week the IMF decided toinclude the yuan in the basket from next year, joining the dollar, the euro,the pound and the yen. 2.If lots of things were priced in SDRs, the IMF’s decisionwould have forced companies around the world to buy yuan-denominated assets assoon as possible, to hedge their exposure. That would have prompted China’scurrency to strengthen dramatically. But few goods or services are priced inSDRs. Instead, admission to the currency club is significant mainly for itssymbolism: the IMF is lending its imprimatur to the yuan as a reservecurrency—a safe, liquid asset in which governments can park theirwealth. Indeed, far from setting off a groundswell of demand for the yuan,the IMF’s decision may pave the way for its depreciation. 3.The reason isthat the People’s Bank of China (PBOC) will now find itself under more pressureto manage the yuan as central banks in most rich economies do theircurrencies—by letting market forces determine their value. In bringing the yuaninto the SDR, the IMF had to determine that it is “freely usable”. Beforecoming to this decision, the IMF asked China to make changes to its currencyregime. 4.Most importantly, China has now tied the yuan’s exchangerate at the start of daily trading to the previous day’s close; in the past thestarting quote was in effect set at the whim of the PBOC, often creating a biggap with the value at which it last traded. It was the elimination of this gapthat lay behind the yuan’s 2% devaluation in August, a move that rattled globalmarkets. Though the yuan is still far from being a free-floating currency—thecentral bank has intervened since August to prop it up—the cost of suchintervention is now higher. The PBOC must spend real money during the tradingday to guide the yuan to its desired level. 5.Inclusion in theSDR will only deepen the expectations that China will let market forces decidethe yuan’s exchange rate. The point of the SDR is to weave disparate currenciestogether into a single, diversified unit; some have suggested, for example,that commodities be quoted in SDRs to reduce the volatility of pricing them indollars. But if China maintains its de facto peg to the dollar, the result ofadding the yuan to the SDR will be to boost the dollar’s weight in the basket,defeating the point. 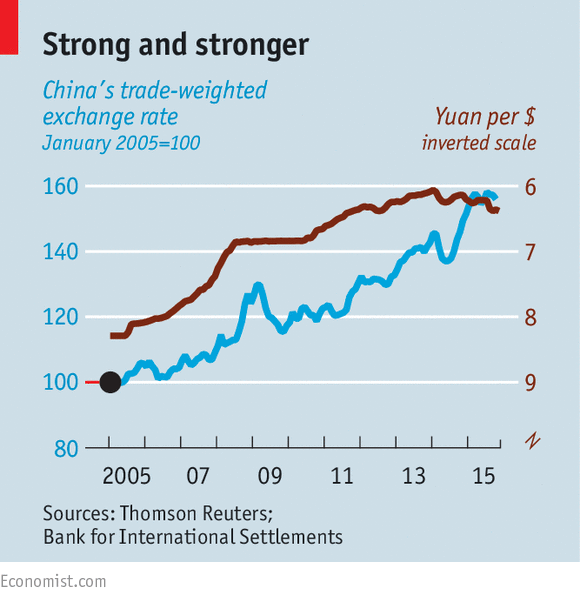 6.What would happen if China really did give the market the last word on theyuan? For some time it has been under downward pressure. The simplest yardstickis the decline in China’s foreign-exchange reserves, from a peak of nearly $4trillion last year to just over $3.5 trillion now—a reflection, in part, of thePBOC’s selling of dollars to support the yuan. Were it not for tighter capitalcontrols since the summer, outflows might have been even bigger. 7.And the yuandoes look overvalued. Despite China’s slowing economy, its continued link tothe surging dollar has put it near an all-time high in trade-weighted terms, upby more than 13% in the past 18 months (see chart). With the Federal Reservegearing up to start raising interest rates at the same time as China isloosening its monetary policy, the yuan looks likely to come under moredownward pressure, at least against the dollar. 8.It would be foolhardy to predict that China will suddenlygive the market free rein. That would go against its deep-seated preference forgradual reform. But while basking in the glow of its SDR status, China mustalso be aware of the responsibility to minimise intervention that comes withit. A weaker yuan may well be the result. Text: This week the IMF decided toinclude [sic, should be to include] the yuan in the basket from next year, joining the dollar, the euro,the pound and the yen. 2. However, 篮 has no above-mentioned sense if Chinese dictionaries are consulted. Since the meaning of word is ever changing, fast or not, as time rolls on, whether or not it has now by convention? I, for one, choose to sit on the fence, for the time being. 3. The basket in reality that housewives brought usually along but nowadays is replaced mostly by plastic bag can be stuffed a thing only, or a group of the same or different things. What's more, no one, at home or abroad, past or present, man or woman, young or old, as far as I know of course, would park his money in basket. 6. Last but not least, do we render a couple of hours as 一夫妇小时 and turn a host of memories into 一东道主、主持人记忆? My comments are for discussion only. Criticisms are always welcome. Sorry I have neither QQ nor micro/short message. But you may approach me at coolfool_sh@yahoo.com. GMT+8, 2019-4-21 04:11 , Processed in 0.051975 second(s), 26 queries .